“Have you ever piloted a Star Trek out of spacedock?” Taking a look at the Star Trek TV pilots, Part 1…. “Star Trek” is a television phenomenon that, like legendary Vulcan Surak’s katra, refuses to die. It’s seen many incarnations. It constantly changes, yet remains somewhat familiar. The mythology/history of the Star Trek universe has, over the course of 50-plus years, become dense enough to make newcomers more than a bit wary. This is the inherent difficulty in launching a new Star Trek series; it has to satisfy the fanbase, yet entice newer viewers who might otherwise be put off by the ‘secret handshake’ (or Vulcan splayed fingers) aspect of it all. But a good Star Trek series pilot can sometimes walk that tightrope of delivering an entertaining piece of television that can both sate the oldsters (like me) and welcome newbies. It’s also interesting to see a familiar franchise you’ve grown up with reinterpreted for a new generation. What will be different? What will be familiar? For these posts (this is part one of two) I want to take a look at each of the various Star Trek series’ pilots, beginning with The Original Series pilot, “The Cage” to Star Trek: Discovery’s “Vulcan Hello” (though I consider Discovery’s pilot to be only one-half of a whole episode; the second half being “Battle at the Binary Stars”). 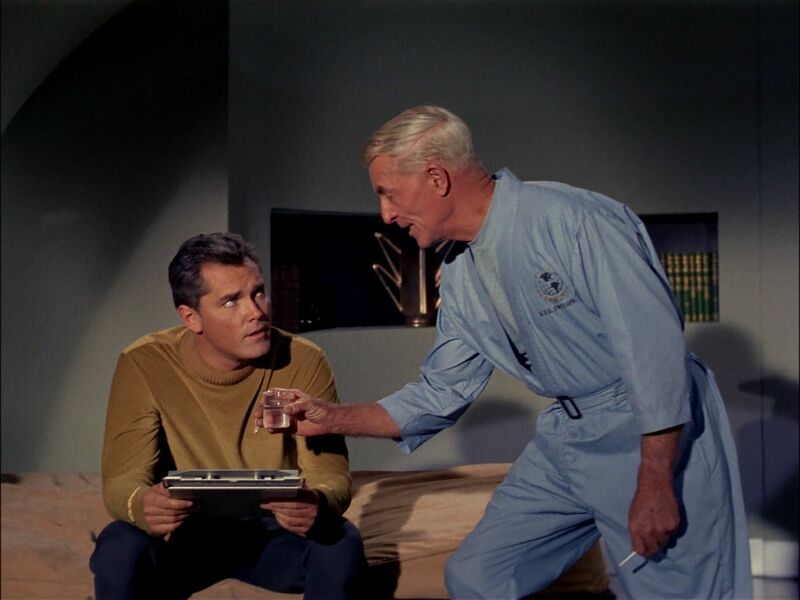 I’m including both pilots of The Original Series (“The Cage” and “Where No Man Has Gone Before”) as they are very different from each other. And as much as I personally enjoy it, I’m not going to include the pilot episode of The Animated Series, since I consider TAS to be an extension of TOS. The only ‘new’ elements of TAS are the half-hour animated format and a couple of new characters. It’s not so much a re-launch as a continuation. It even includes most of the TOS cast (except for Walter Koenig’s “Chekov”). I’m also skipping lengthy plot summaries, as I’m assuming my readers have already seen each of these pilots (perhaps more than a few times each…). You’ll also see my noted ‘champagne bottle’ moments, which note the metaphorical christening moments from a previous Star Trek series to its successor. 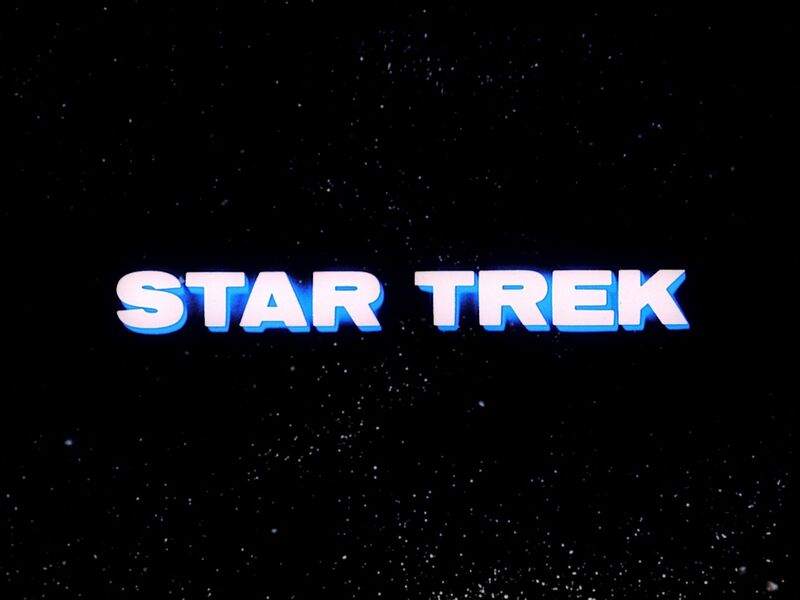 Until 1986, I’d never seen the original Star Trek pilot in its entirety. I’d seen only the footage of it that was incorporated TOS’ only two-parter, “The Menagerie”; a very clever episode that skillfully absorbs the differences of “The Cage” into TOS’ overall mythology. 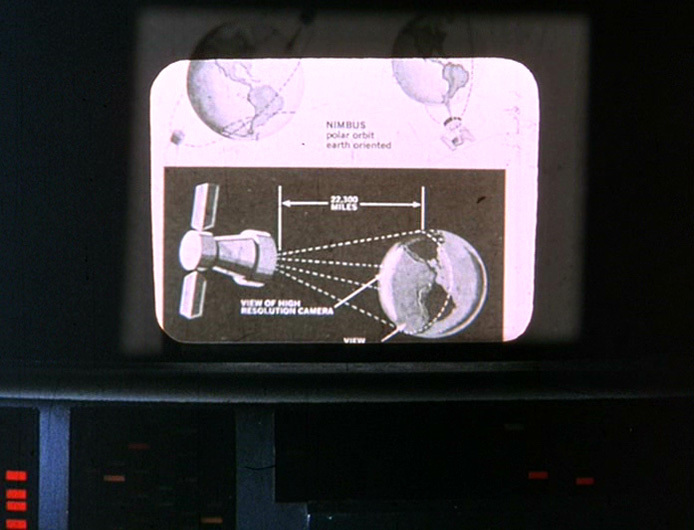 In my opinion, the most interesting of these recovered scenes was when the Talosians seemingly hack into the Enterprise’s computers and download their historical records (note: the remastered version shows different, updated images flashing by on the ship’s monitors). At any rate, it was quite a treat to finally see the entire episode. 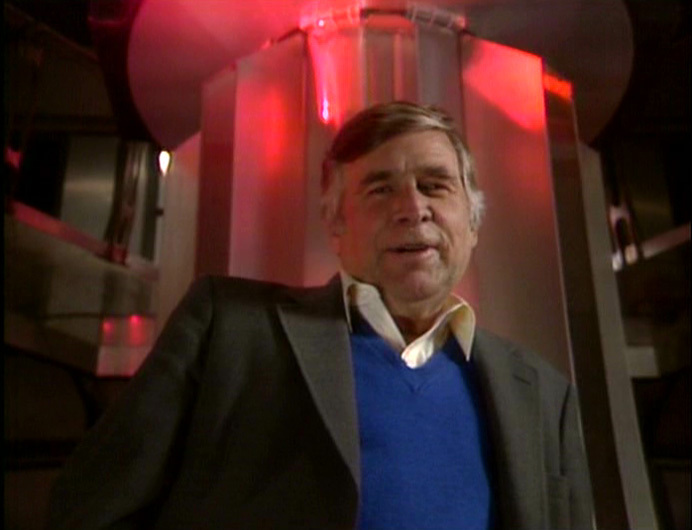 The video also came with bookend talks from Gene Roddenberry himself (filmed on the Star Trek movie sets). Two years later in 1988, a fully restored all-color version was somehow ‘found’ in a vault at Paramount and broadcast (let the double-dipping begin…). The tone of “The Cage” is a bit more somber and humorless than the series that followed. 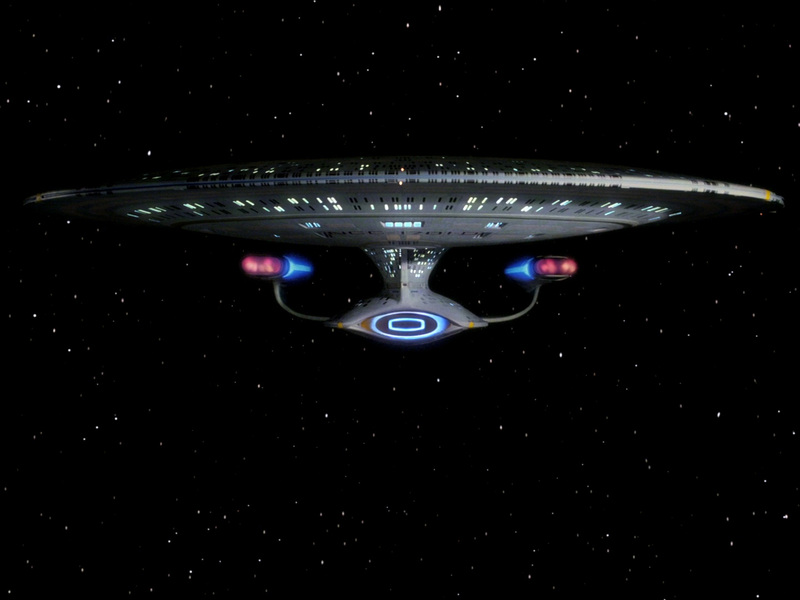 Even the starship Enterprise’s familiar, primary color accented-interiors are rendered in blacks, grays and silvers. It has more of a “Forbidden Planet” vibe about it than TOS. 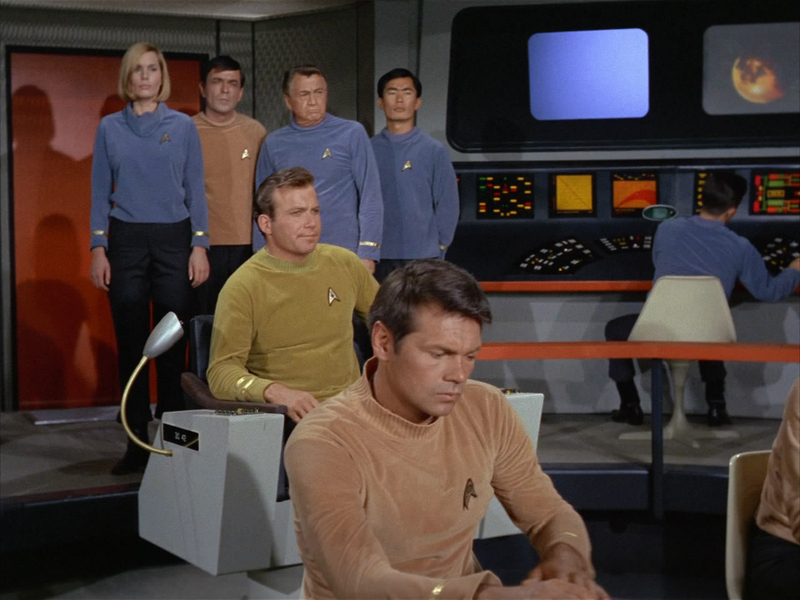 Save for a lone Asian crewman in the ship’s transporter room, there is also a noticeable lack of diversity in this USS Enterprise’s crew, which was rectified in the series that followed. 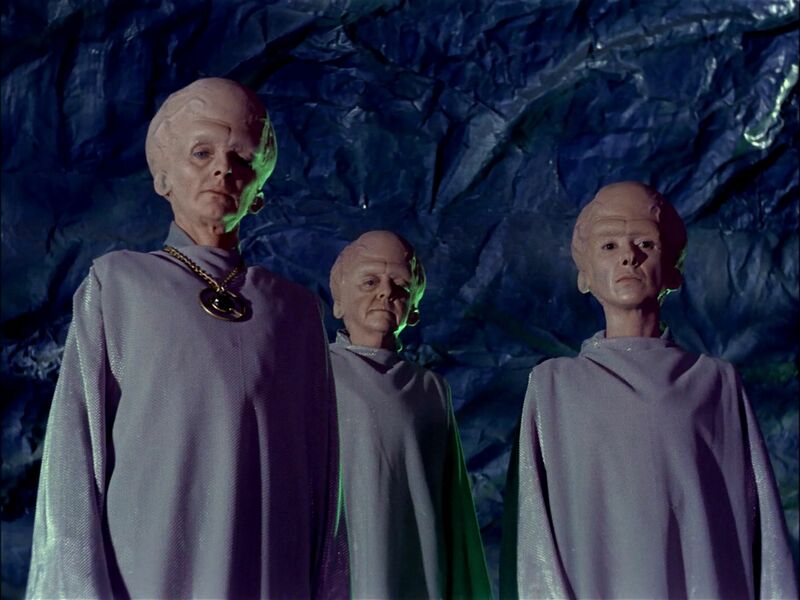 The alien Talosians are thoroughly effective and creepy-as-hell, too. 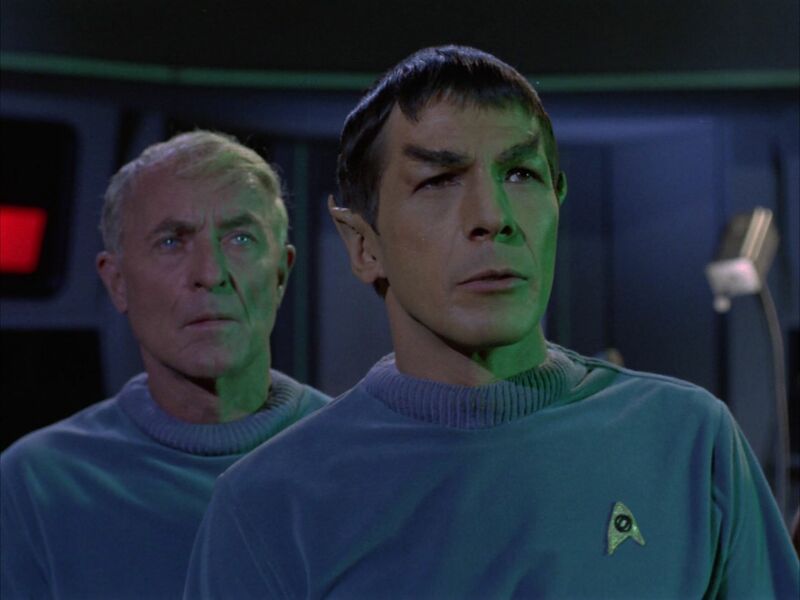 The pulsating veins in their oversized heads and androgynous vibe (female actors dubbed over with male vocals) make them some of the most truly ‘alien’ races we see on TOS. 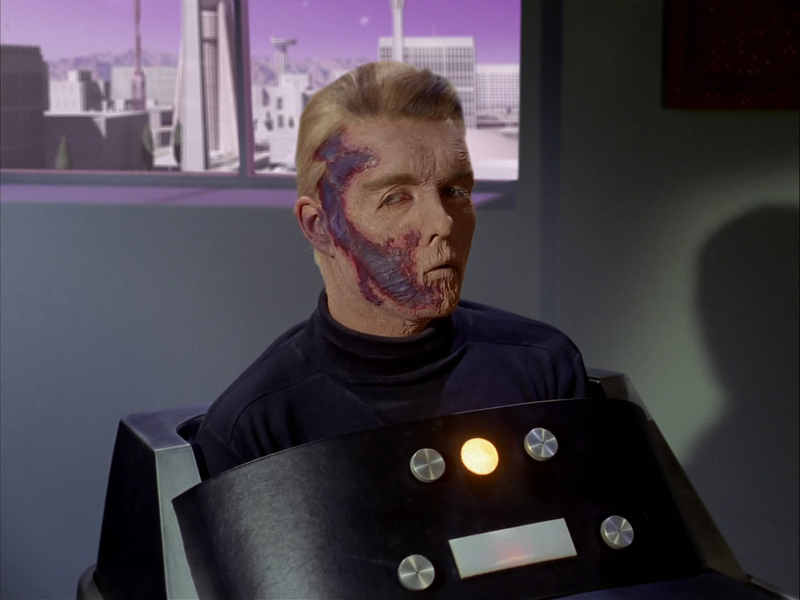 They also, like many other ‘villains’ in TOS, have a sympathetic motive to their actions as well. Jeffrey Hunter’s Captain Christopher Pike is a somewhat more introspective captain than William Shatner’s less-restrained James T. Kirk. Pike reminds me a bit more of future Enterprise captain Jean-Luc Picard in that respect. Majel Barrett’s nameless executive officer “Number One” was also a major leap forward in gender equality for 1964 (the year of the pilot’s production). We wouldn’t see a female character hold such rank in Star Trek until Nana Visitor’s Major Kira Nerys in “Deep Space Nine” almost 30 years later (and a series’ female captain two years after that). Writer/producer (and “Great Bird of the Galaxy”) Gene Roddenberrry was quite forward-thinking for the time. 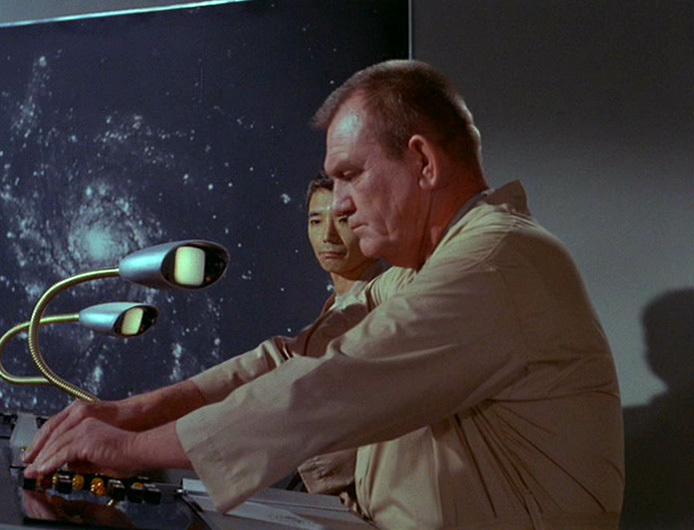 The ship’s doctor is Philip Boyce, played by “Twilight Zone” veteran character actor John Hoyt. Boyce is an older man than Dr. McCoy, but retaining much of Dr. McCoy’s cantankerousness. Boyce also shares McCoy’s unofficial duty of being the captain’s personal psychiatrist when needed. There’s that terrific scene in Pike’s quarters early on, where they share a drink as Pike unburdens himself to the doctor. 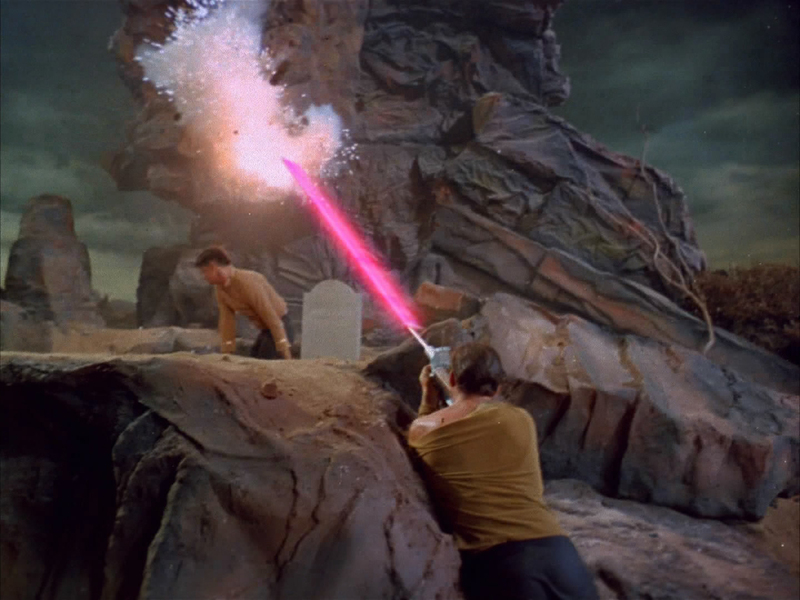 It’s a scene repeated many times with Kirk and Bones throughout TOS (“Balance of Terror” “Ultimate Computer”) and even the movies (“The Wrath of Khan” “Star Trek Beyond”). 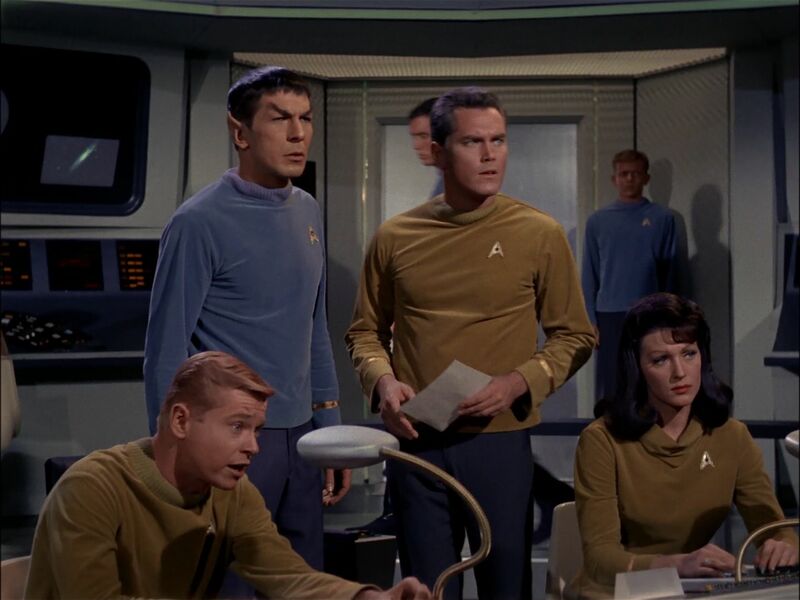 The supporting characters are all different as well, with fresh-faced young navigator Jose Tyler (Peter Duryea), and a young female Yeoman named Colt (Laurel Goodwin), who was a predecessor to TOS’ Yeoman Rand. The only familiar character we would see in later Star Trek was Leonard Nimoy’s “Mr. 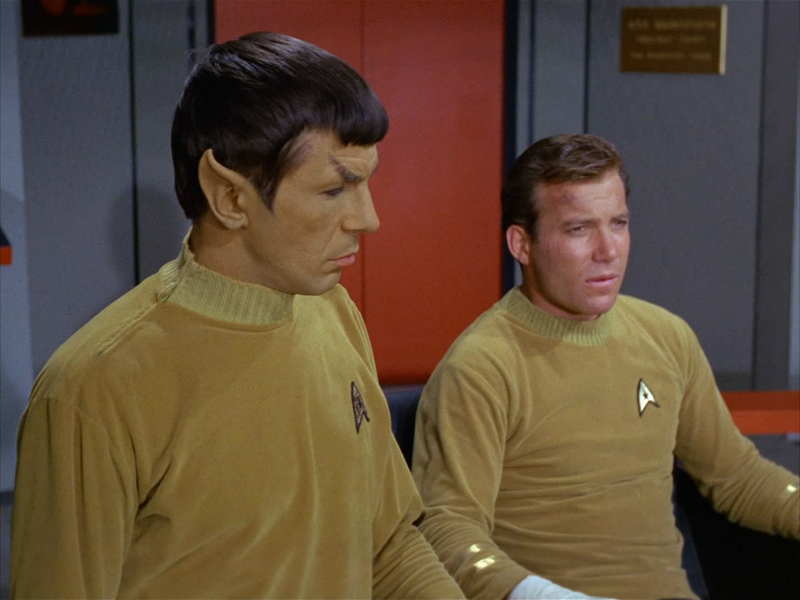 Spock”, who is somewhat different from the character we see in TOS. In “The Cage” he shouts, smiles at a singing plant, and is far more demonstrably emotional than the reserved, sly, saturnine Vulcan we get to know and love later on. ^ The remastered version of “The Menagerie” is the version I saw in cinemas in 2007. Actor Sean Kenney played the disfigured version of Captain Pike for the framing story. In 2007, I had the chance to see “The Menagerie” (The Cage’s eventual broadcast form) in cinematic release for a one-night “Fathom Event” AMC Theatre special screening. Other than the presentation being a bit too dark (a projection issue), it was a unique experience to see “The Menagerie” on a big screen. On a big screen, “The Menagerie” feels much more like a classic science fiction movie than an extended pilot for a television show. I’m not sure how sustainable Star Trek would’ve ultimately been with this more somber series format. Sometimes I imagine what a full series of “Star Trek” with Hunter’s Pike as captain would’ve been like. 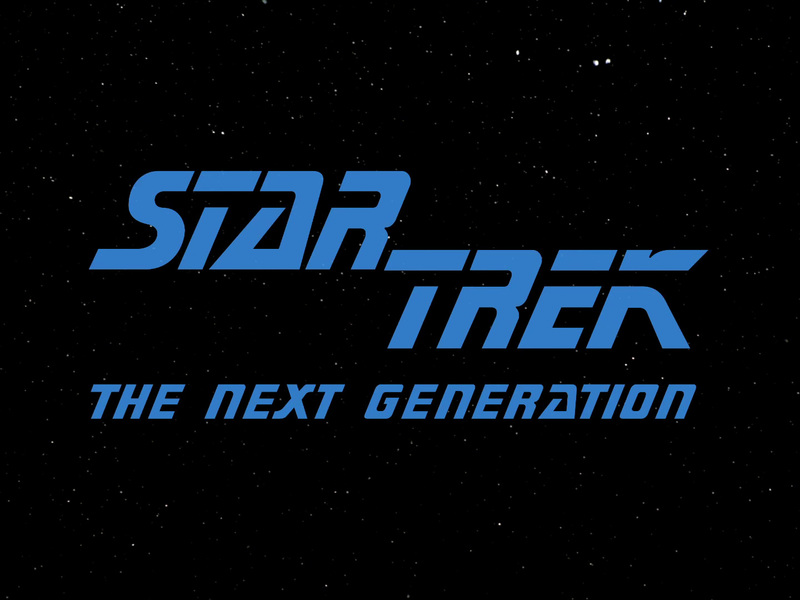 I think it might’ve more closely resembled “The Next Generation” in some respects (calling the first officer “Number One” for example, as well as a more introspective captain). Sadly, Jeffrey Hunter passed away after complications from a fall in May of 1969, so he was never able to reprise the role. Actor Sean Kenney, under heavy prosthetics, played the ‘injured’ Capt. Pike in 1966’s “The Menagerie” since Hunter wasn’t needed to play such a disfigured version of the character. Capt. Pike would be seen again (played by Bruce Greenwood) in the first two Bad Robot reboot Star Trek movies movies, and is coming back in the second season of “Star Trek Discovery.” He will now be played by actor Anson Mount, who bears a striking resemblance to the late Hunter. There are also several very interesting non-canon Capt. Pike novels out there as well (“Burning Dreams” and “Vulcan’s Glory” come to mind). 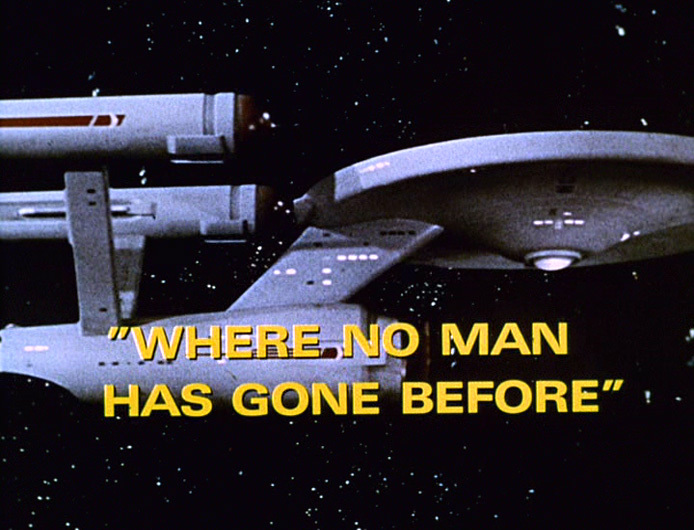 * Where No Man Has Gone Before. Aka, the one that sealed the deal. While “The Cage” failed to sell the series, the concept was given a second chance with his more familiar feeling Samuel A. Peeples’ scripted pilot (Peeples would also write a early, rejected draft of what eventually become “The Wrath of Khan” 17 years later). William Shatner takes over the center seat as the more outgoing Captain James T. Kirk, in contrast to the more brooding Chris Pike. 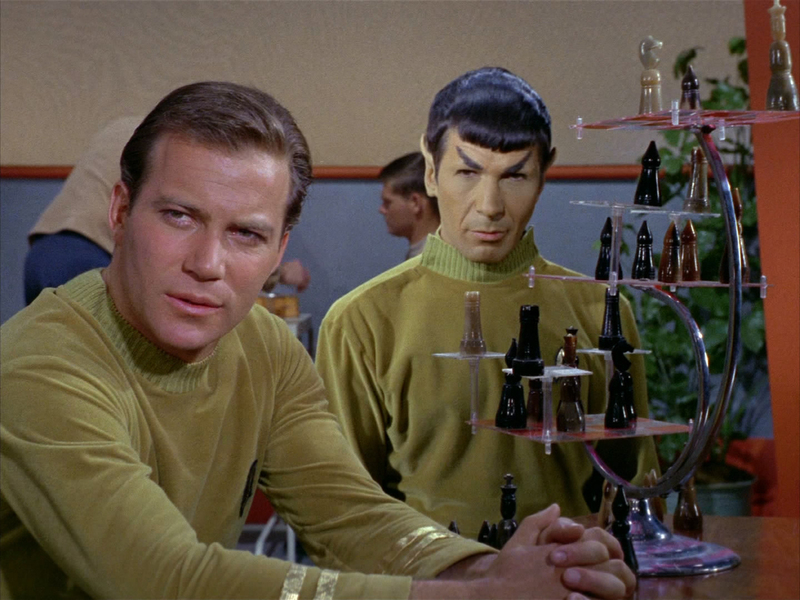 Kirk plays chess in the ship’s recreation room with his Vulcan science officer Spock (a returning Leonard Nimoy) in his off-hours. We even meet Kirk’s old academy buddy who now serves under him, Lt. Commander Gary Mitchell (“2001: A Space Odyssey”’s Gary Lockwood in a memorable, very effective performance). 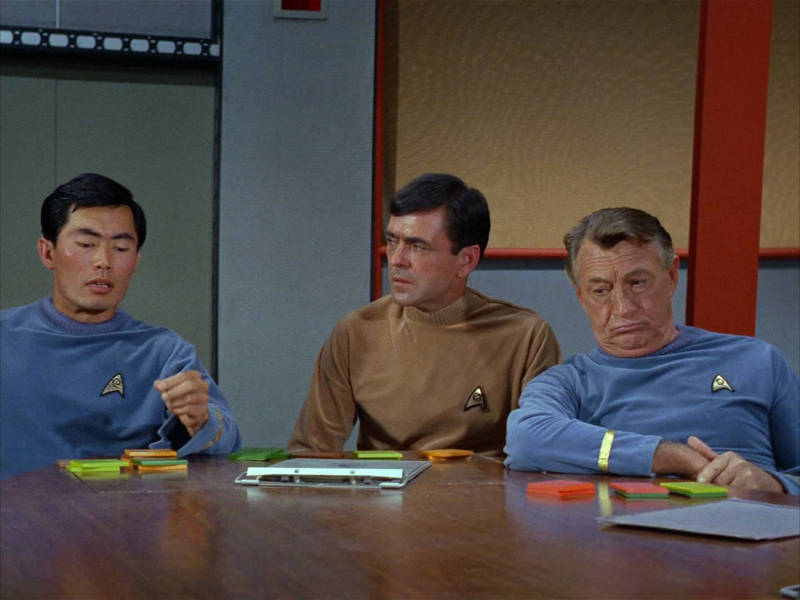 TOS series regulars Sulu (George Takei) and Scotty (James Doohan) are also present this time around, though Sulu is the ship’s physicist here, and not the helmsman. Uhura (Nichelle Nichols) and Bones (DeForest Kelley) are still conspicuously absent, and in their places are a black male comm officer Mr. Alden (Lloyd Hanes) and a much older, somewhat generic ship’s doctor named Piper (played by Paul Fix). 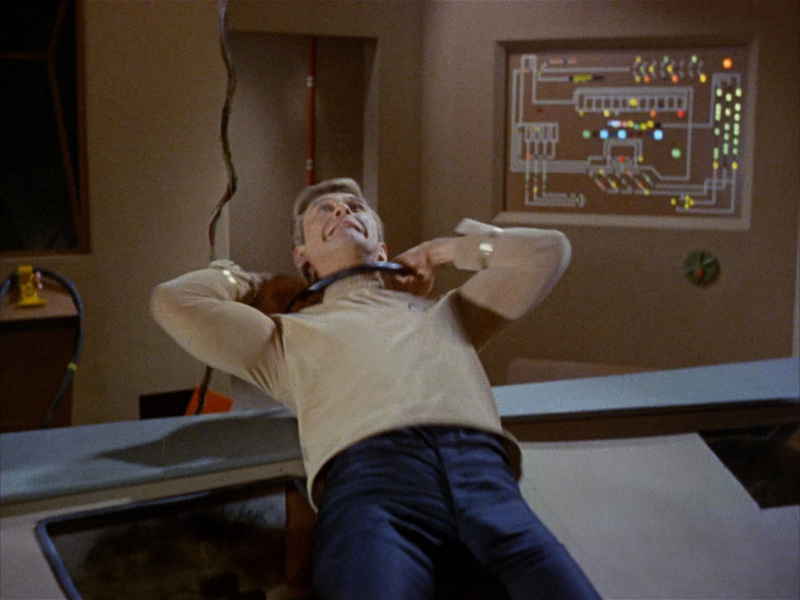 Piper has none of the easygoing chemistry with Captain Kirk that McCoy would later possess. Paul Carr plays Lee Kelso, the ship’s ill-fated helmsman…and the poor guy wasn’t even wearing red. 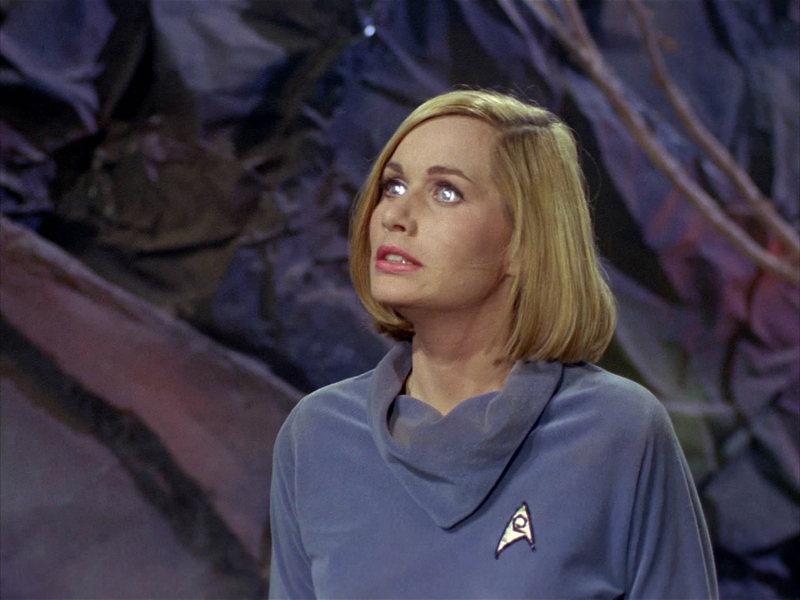 Sally Kellerman (Major “Hotlips” Houlihan in the 1970 film of “MASH”) effectively rounds out the cast as the equally ill-fated ship’s psychiatrist; a forerunner to Next Gen’s Deanna Troi (Marina Sirtis), or even Elise McKennah (Michele Specht) in the amazing TOS-era fan film series “Star Trek Continues”. My own pic of Sally Kellerman, taken at the 2016 Star Trek convention in Las Vegas. We also shared an elevator ride later, after she’d spent a very long day signing autographs. I’d also met Gary Lockwood many times at conventions, going way back to one of my very first conventions at Pasadena, in 2002. He’s a nice guy, and kinda reminds me of the cool uncle at the family barbecue. Did I mention that “2001: A Space Odyssey” is one of my favorite movies of all time?? 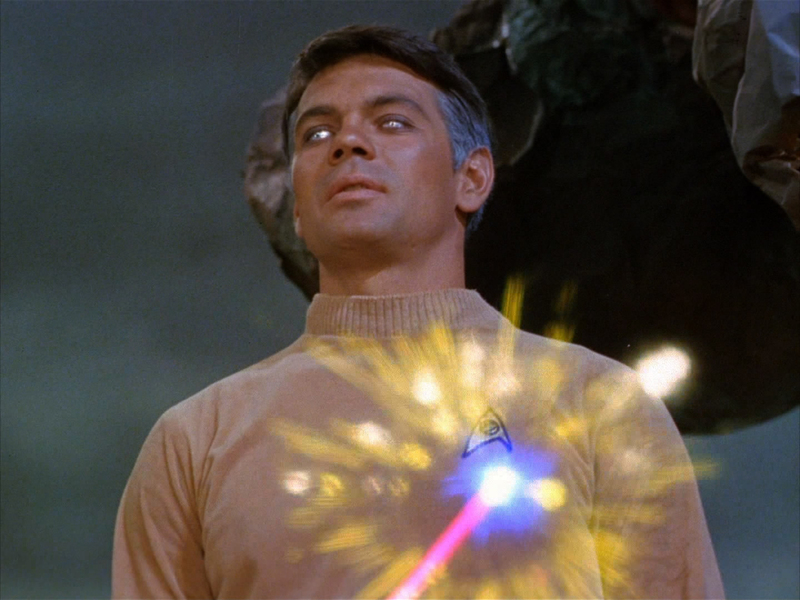 In what would be a recurring motif throughout Star Trek (past and present), ordinary humans are bestowed with godlike powers and, as “Star Trek” repeatedly and profusely states, “absolute power corrupts absolutely.” This theme would be seen in TOS’ “Charlie X” “Whom Gods Destroy” and in many episodes of TNG as well, including “The Nth Degree,” which is essentially TNG’s remake of “Where No Man…” without the tragic ending. 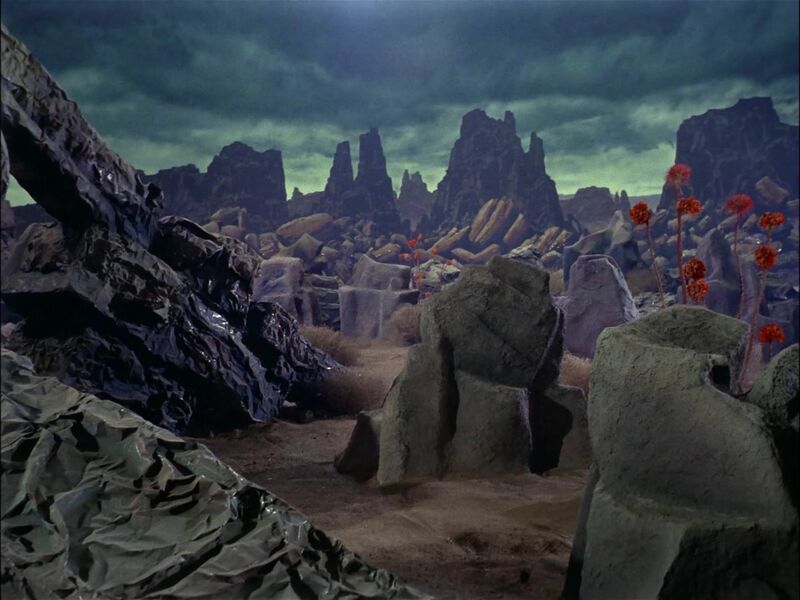 The Talos IV planetary set from “The Cage” was reused to suggest landscapes for Delta Vega, and the previously black/gray/silver motif of the sets is brightened and given splashes of color similar to what would be used as the series went into regular production. 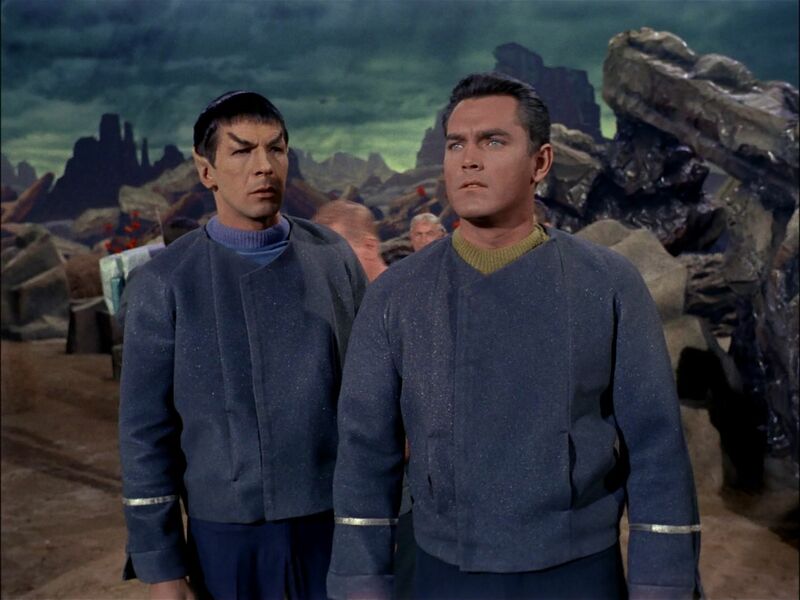 The uniforms are also similar to what was used in “The Cage” and still lack the distinctive black collars and familiar ranking ribbons of the more familiar TOS uniforms. No miniskirts yet, ether. Despite some cosmetic changes later on, the die was pretty much cast with TOS’ “Where No Man…” and the rest is TV history. The Great Bird Returns to TV. 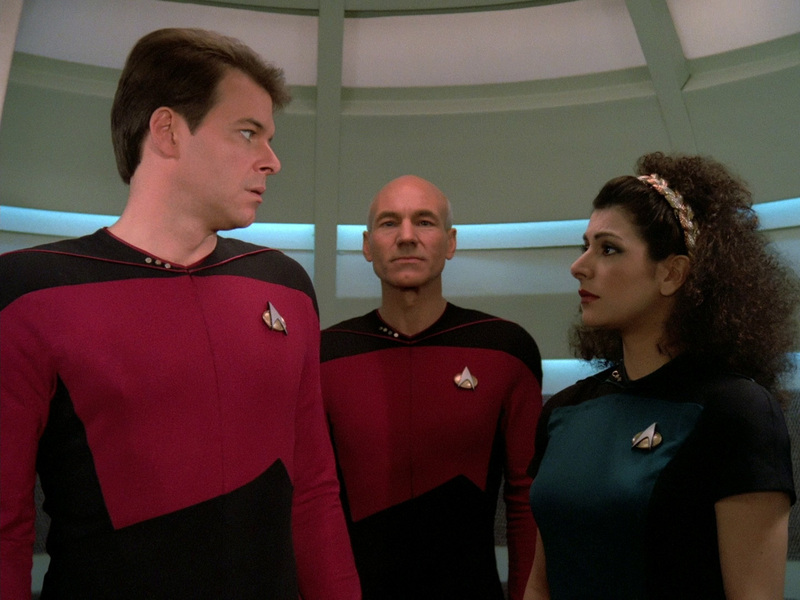 After several successful movies, the Star Trek franchise returned to live-action television in 1987 with Roddenberry’s “Star Trek: The Next Generation” (TNG). The USS Enterprise-D had a bit of a turbulent liftoff with “Encounter at Farpoint.” Of all of the Star Trek pilots, “Farpoint…” is arguably the weakest. 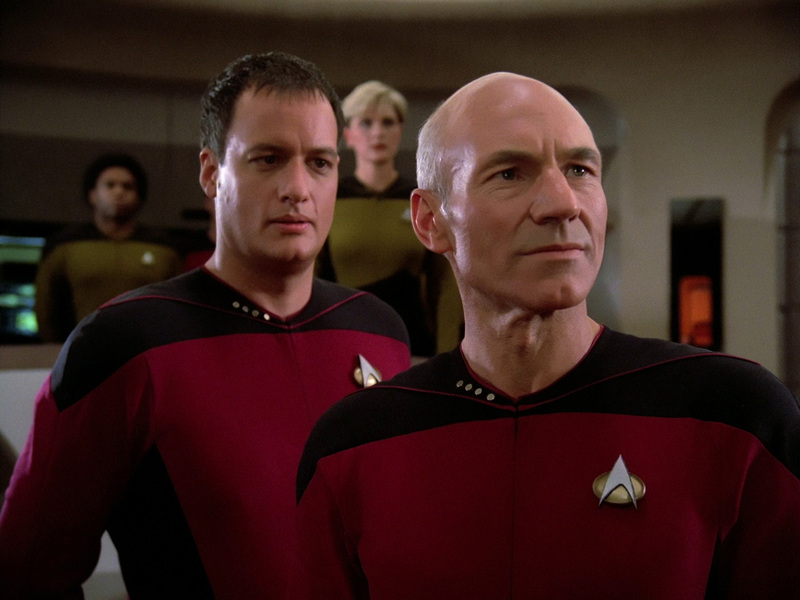 I’d previously reviewed TNG’s “Encounter at Farpoint” at length for TNG’s 30th anniversary so I won’t rehash the full plot synopsis here, but I’d like to add a few more things for this post. 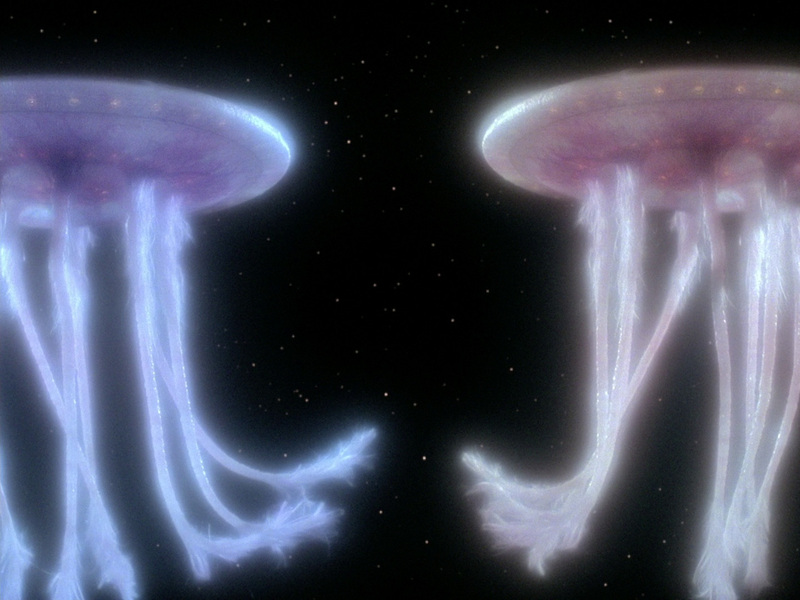 The big climactic ‘reveal’ of Farpoint station being a giant, wounded shapeshifting cosmic jellyfish in search of its lover feels more like something lifted from The Animated Series. 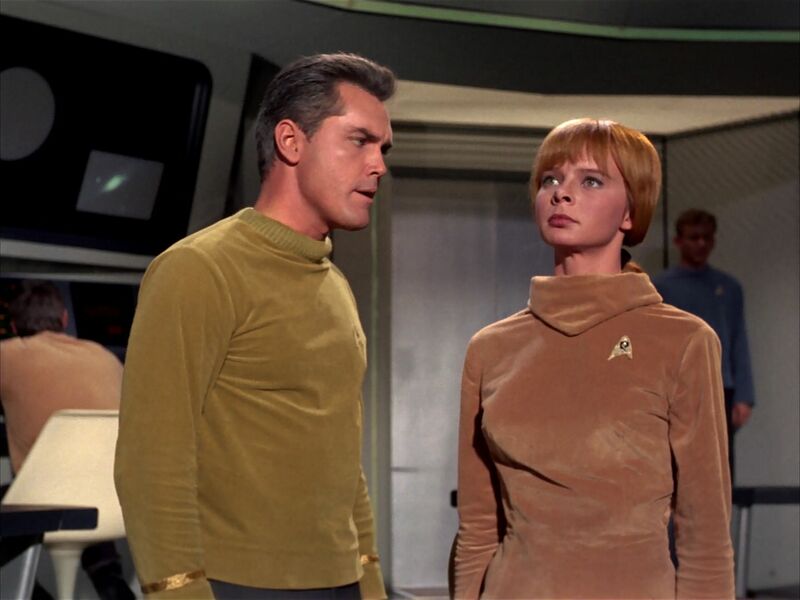 The Q trial framing story was written by Gene Roddenberry to fill the two-hour time slot, while the main Farpoint story was written by TOS veteran Dorothy Fontana, who penned some of my favorite episodes of that series. 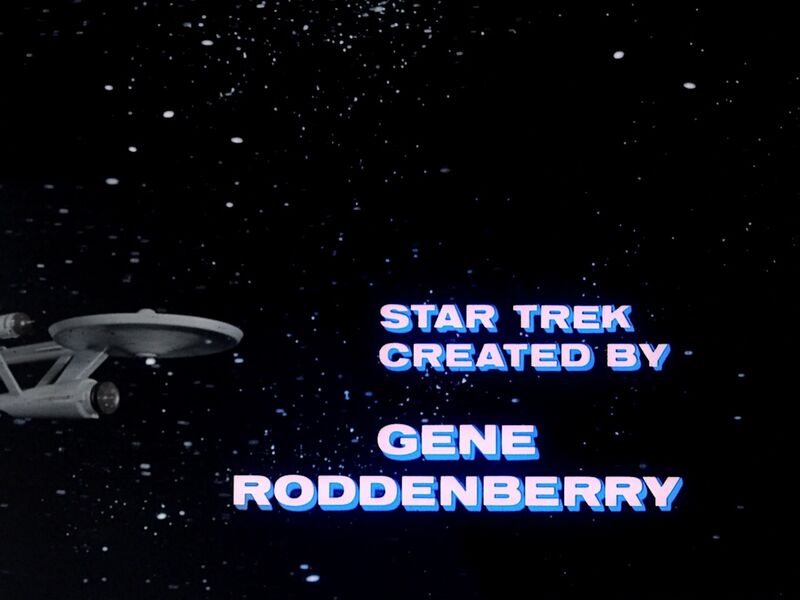 While the teaming of TOS series creator Roddenberry and TOS story editor/writer Fontana sounds incredible on paper, it doesn’t work so well in execution. The two very different stories are awkwardly smashed together. The main characters are crudely established at best. Some of them are radically different from their later versions; particularly Sir Patrick Stewart’s Captain Jean-Luc Picard, who would later become my favorite Star Trek series captain. 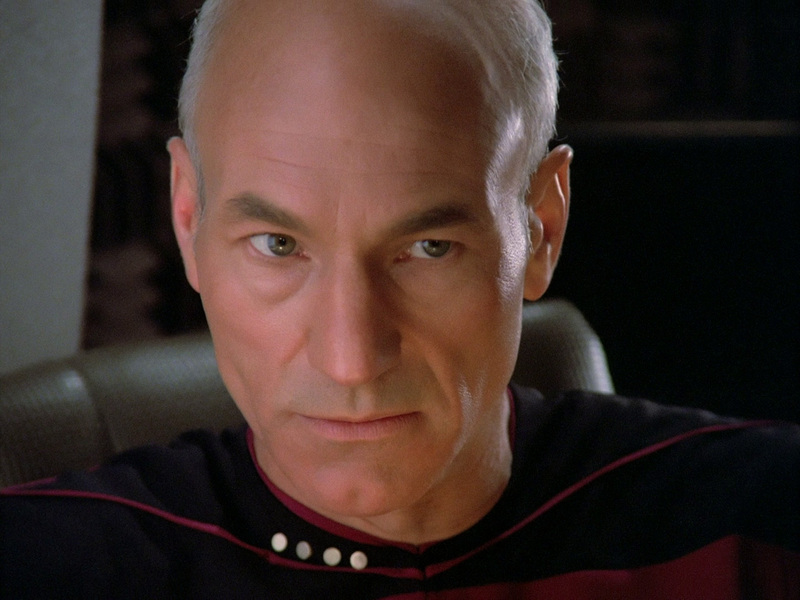 In “Farpoint,” Picard is less the paternal, caring humanist and a bit more Ebenezer Scrooge (Stewart, in fact, starred in a one-man stage production of “A Christmas Carol” as well as a subsequent TV version in 2000). We see Picard awkwardly barking orders (“Shut off that damn noise!”) and saddled with an unease around children, as if to make the character even less likable. Stewart (and the TNG writers) would subtly soften the character quite a bit over the run of the series, and dull many of the sharper edges that we saw in “Farpoint” (and throughout much of S1). Despite “Farpoint” and its many failings, Stewart is still (in my opinion) the finest actor to ever play a Star Trek captain. He would prove this many times over, in fact. “Farpoint” however, is not the Jean-Luc Picard character at his best. The other characters offer the merest hints of their later warmth, capabilities and potential. Jonathan Frakes’ Commander Riker feels like a Kirk-wannabe in “Farpoint.” He is clearly meant to be the younger ‘action guy,’ and he is also given an awkward, one-that-got-away romantic subplot with Deanna Troi (Marina Sirtis). 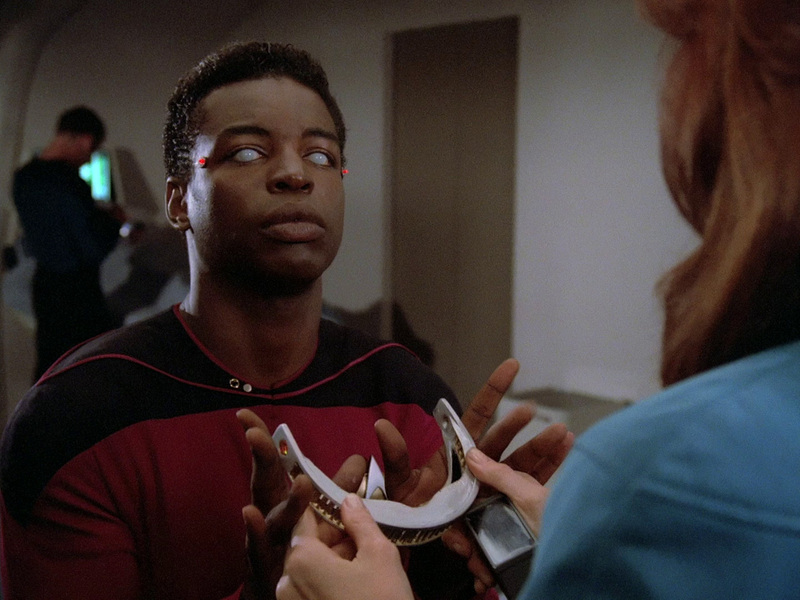 Le Var Burton’s blind navigator Lt. Geordi La Forge is more a walking storytelling device than a flesh and blood character, using his visor to ‘see’ further into the EM spectrum where others can’t. Le Var Burton was an Emmy winner for his role as Kunte Kinte in “Roots” (1977) but he is little more a walking/talking prop in “Farpoint.” Critical underuse of a terrific actor. 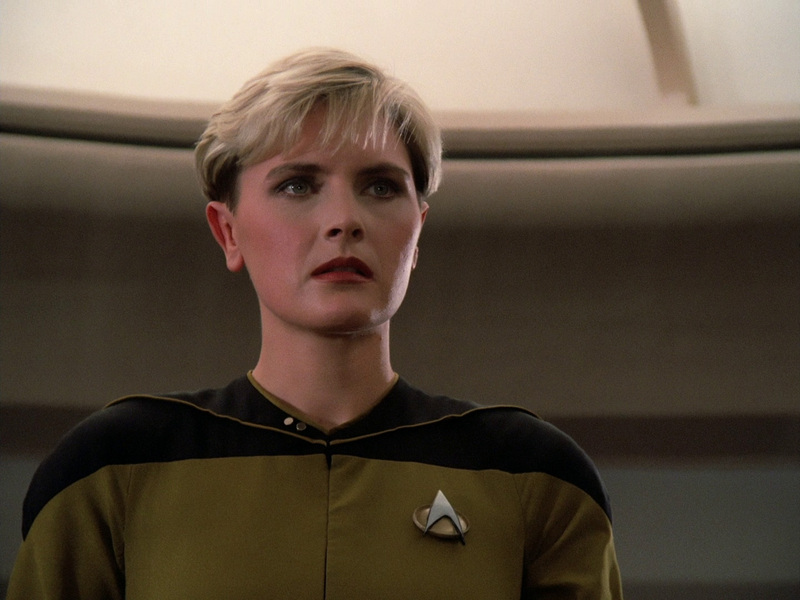 Denise Crosby plays fiery security chief Lt. Tasha Yar. Crosby left the series fairly early in its run, after her role failed to significantly develop. She would later return in several episodes both as an ‘alternate reality’ Tasha and as Tasha’s half-Romulan daughter Sela. Marina Sirtis as Counselor Deanna Troi is the Betazoid ‘empath’ who basically senses and involuntarily acts out the emotions of other beings/creatures (the ‘acting out’ part would disappear later on, thank goodness). Like La Forge, the character is less ship’s therapist and more walking storytelling device (“I feel…great joy, and gratitude!”). Troi was a character in search of good writing. The character was largely ill-served until later in the series’ run. 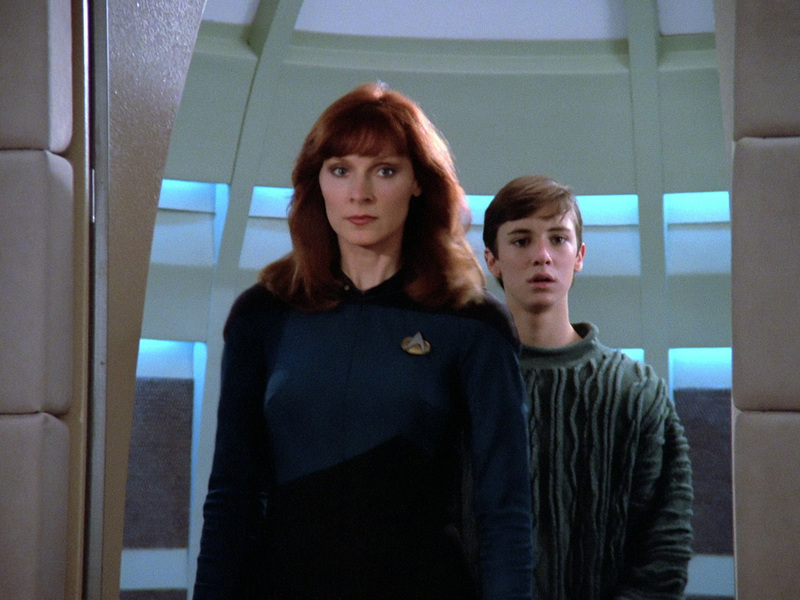 The ship’s Chief Medical Officer is Dr. Beverly Crusher (Gates McFadden), who never really registered for me as an effective or even interesting character. Also poorly served is the terrific “Stand By Me” child actor (and later internet sensation) Wil Wheaton playing Crusher’s genius son Wesley. Wesley spends most of “Farpoint…” either getting in the way, or getting yelled at by adult characters. He would later lapse into a cliche of saving the ship every week. I feel badly for Wheaton, since none of the character’s issues reflect his ability as an actor or as a human being. I follow him on social media, and I’ve met him a few times… he’s a terrific guy. The only characters who escape the shaky pilot relatively unscathed are Brent Spiner as the Pinocchio-like android ops officer Lt. Commander Data and the Klingon bridge officer, Lt. Worf (Michael Dorn). In addition to being Pinocchio, Spiner is also the series’ ‘anti-Spock’; the emotionless being (by design) who yearns to be human. 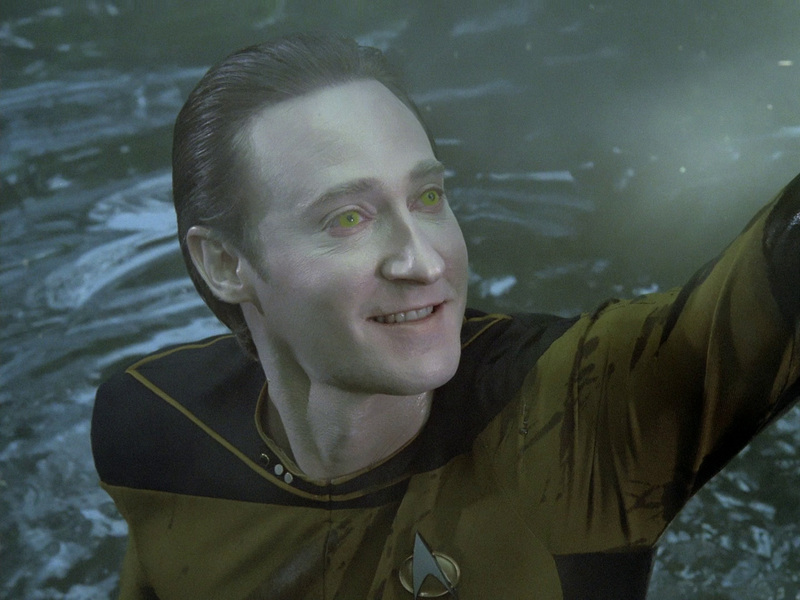 Data would become an immensely popular character after the pilot, and other than a slightly creepy smile in his holodeck scene, the character is effectively set. 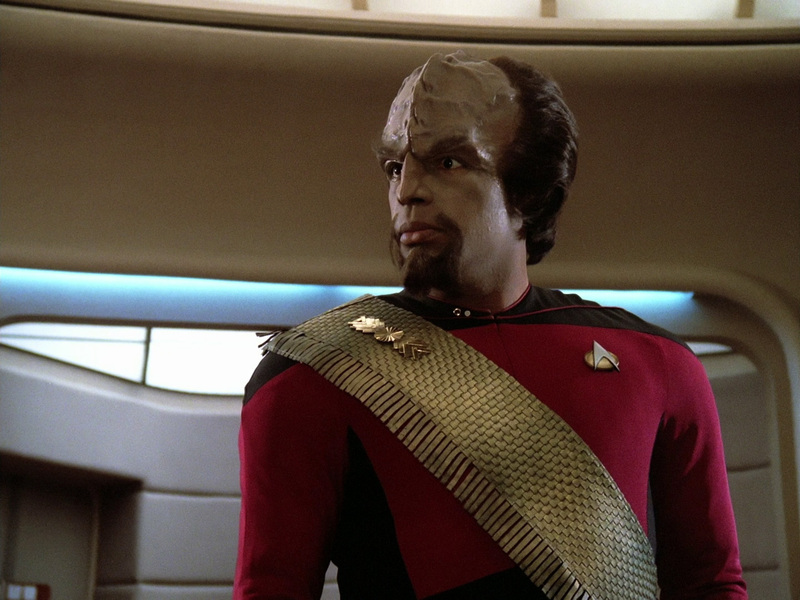 Michael Dorn’s Worf would go on to become so popular that he would later go on to costar on “Deep Space Nine” after the end of TNG. In “Farpoint” Worf is largely a grumpy sourpuss who barks a lot. He lack the shadings and indirect humor that would later come to define him. The Next Generation cast reunites (except for Jonathan Frakes, who was unavailable) for the show’s 30th anniversary celebration in Las Vegas last year. I’ve met many of TNG’s cast members in person, including Spiner, Sirtis, Wheaton, Crosby, De Lancie and Burton and they are a delightful bunch. Sirtis has wit and charm to light up a room. She also keeps audiences in stitches at conventions with her wonderfully blunt sense of humor. 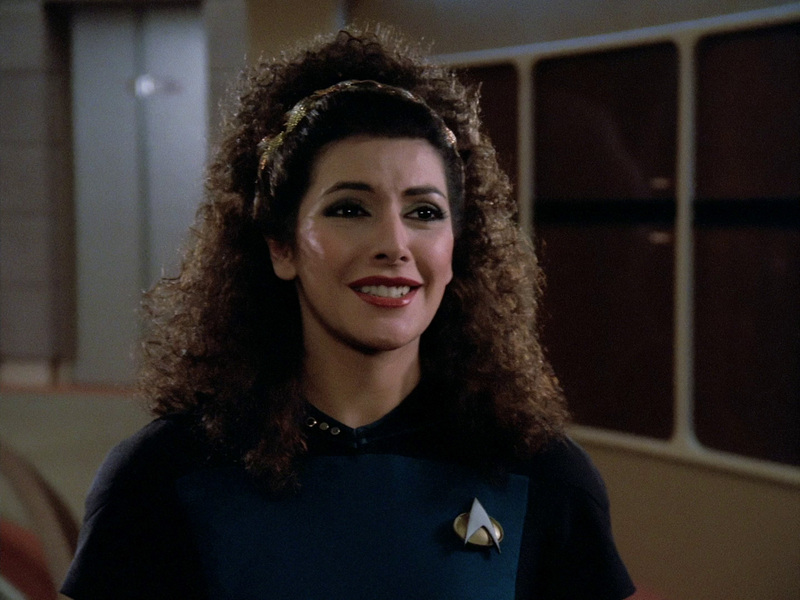 If only Troi had been half as much fun as the actress who played her. 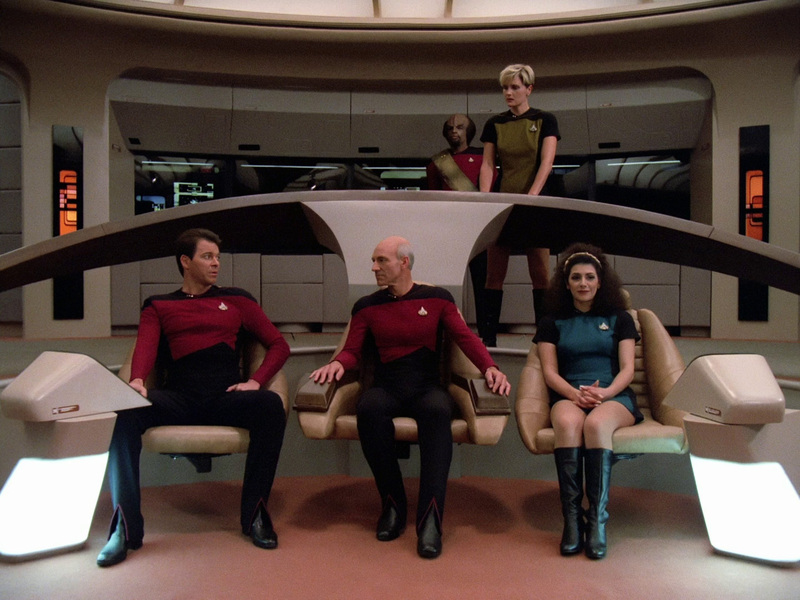 Despite this shaky start, TNG would go on to create some of the best stories (and characters) in all of Star Trek. To be honest, if “Farpoint…” didn’t have the Star Trek brand name, I’m not sure if would’ve stuck with it after the pilot. However, the audience would eventually be richly rewarded for its faith and tenacity; and for not judging a book by its deeply flawed cover. 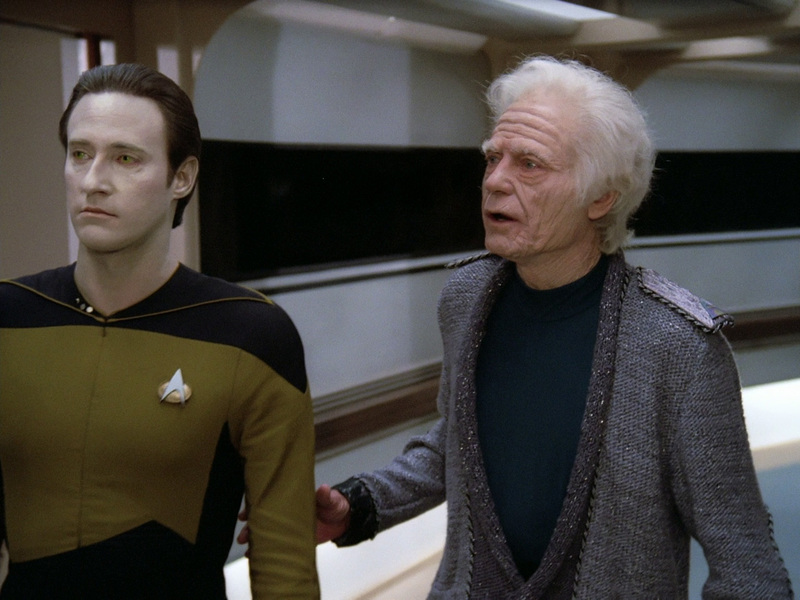 Champagne bottle moment: De Forest Kelley gives the new ship a nice sendoff as a 137 year old “Admiral McCoy” in a lovely scene with Data that recalls the curmudgeonly doctor’s barb-trading with Mr. Spock in TOS. 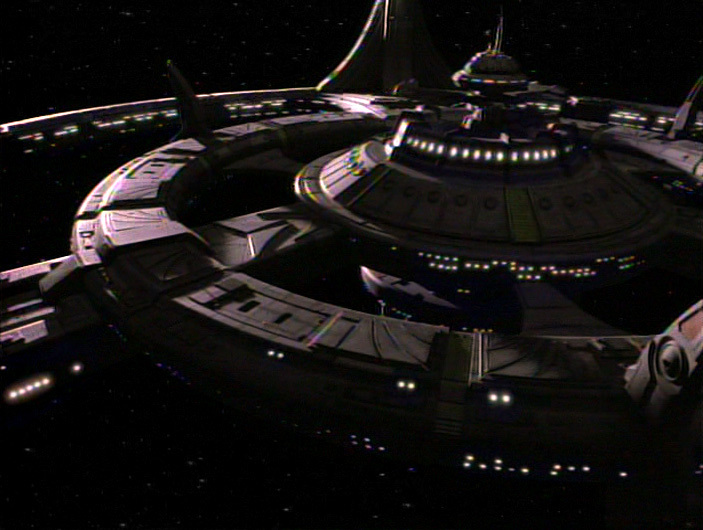 “Deep Space Nine” was the next Star Trek spinoff, and if TNG was continuing Roddenberry’s “Wagon Train to the Stars”, then DS9 was more like “Gunsmoke.” DS9 was a permanent outpost that, instead of zipping all over the galaxy, stayed in one corner of it and made that corner home. DS9 is also my personal favorite of the post-TOS spinoff Star Trek series. This was also the first Star Trek spinoff that wasn’t personally overseen and/or pitched by TOS creator/producer Gene Roddenberry, as he passed away in late 1991. DS9 was conceived by Rick Berman (TNG’s producer and writer) and the late Michael Piller (also a TNG writer/producer who came aboard in TNG’s 3rd season). 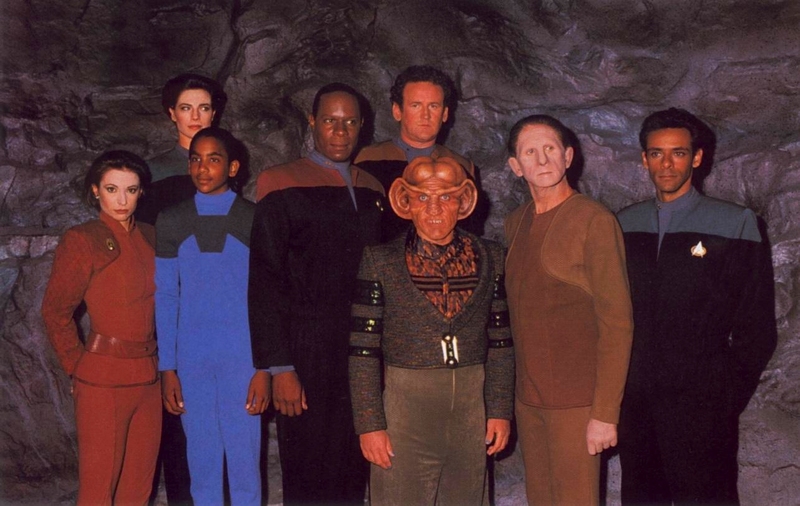 DS9 would also have the richest ensemble cast of any Star Trek series, as well as a very memorable cast of secondary characters who could easily fill their own spinoff. So many would contribute to the creative successes of the series later on, including writer/producers Ira Steven Behr, Ronald Moore, and Robert Hewitt Wolfe to name a few. 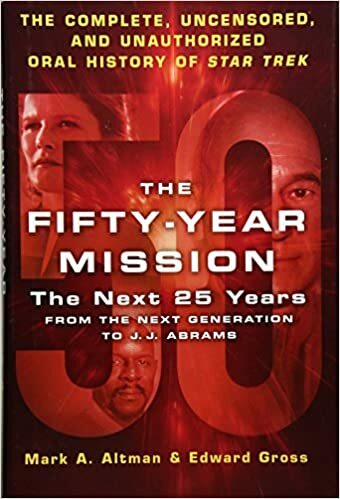 Like “Encounter at Farpoint”, I’ve discussed Deep Space Nine’s pilot episode “Emissary” at length for the show’s 25th anniversary but there are some other bits I’d like to add here as well. Having a far smoother and well-oiled opener than TNG’s “Farpoint,” DS9’s “Emissary” feels more like a show in its second or third year than a more typically awkward pilot. 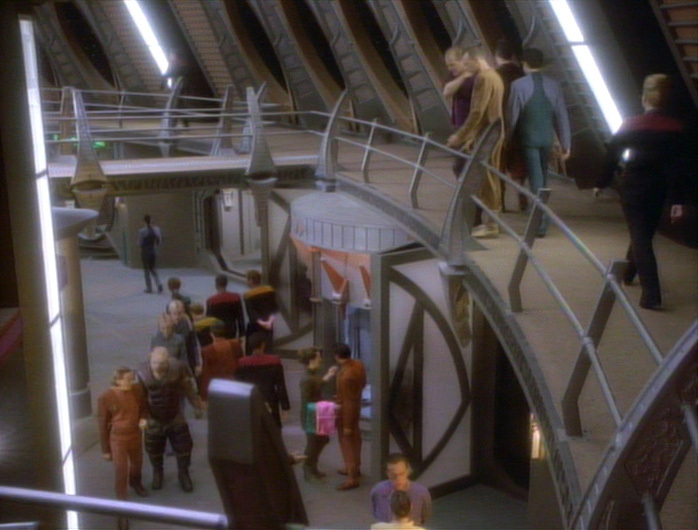 The scale of the sets is more suggestive of a feature film than a television series, with a huge multilevel ops set (which includes an enclosed commander’s office), as well as a two-level promenade and bar set (“Quark’s”). Most of the cast are solid, but some haven’t quite found their characters just yet. 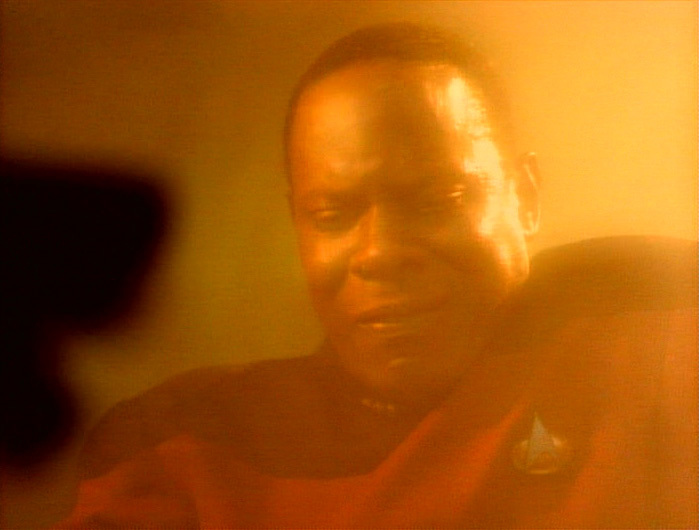 Avery Brooks’ Commander (not Captain yet) Benjamin Sisko is a bit stiff at first, though he really lets loose with the emotional fireworks in his final scenes with ‘the Prophets.’ Like Stewart’s Picard, he would evolve considerably over the course of the series. He was also a widower and single father to young Jake (a very young Cirroc Lofton). 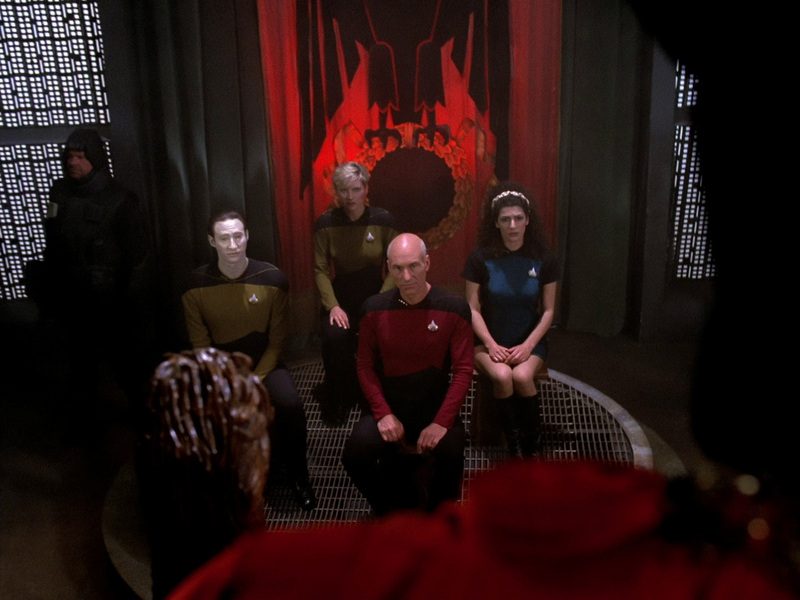 This was new territory for Star Trek; a commanding officer who had a family life beyond his command and his crew. 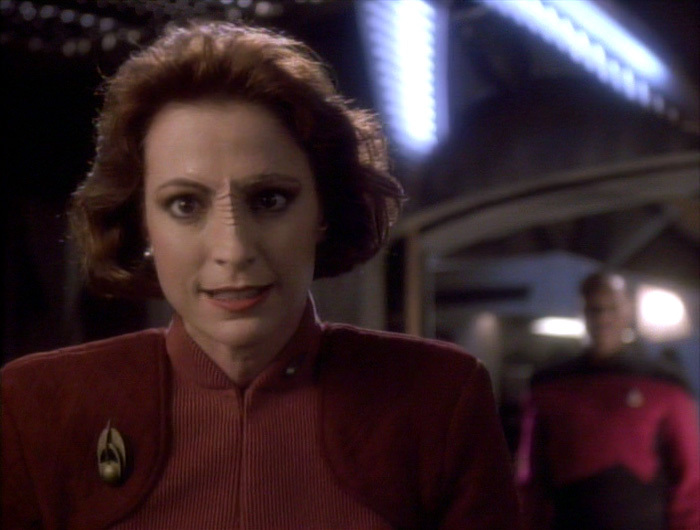 Nana Visitor’s Major Kira Nerys is clearly defined in the pilot, though her hostility cools considerably over the run of the series, she never loses her spirit or appetite for a good fight. 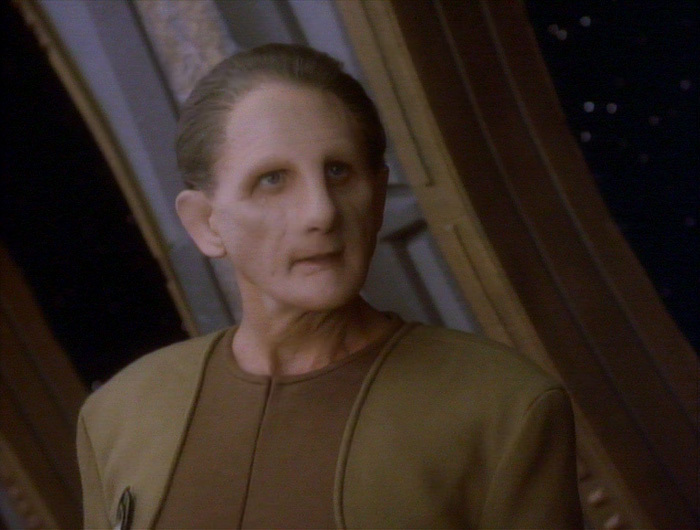 Rene Auberjonois’ grumpy shapeshifting security chief Odo wears a slightly different uniform color and uses a less gruff voice for Odo in “Emissary”, but he is essentially set as a character. 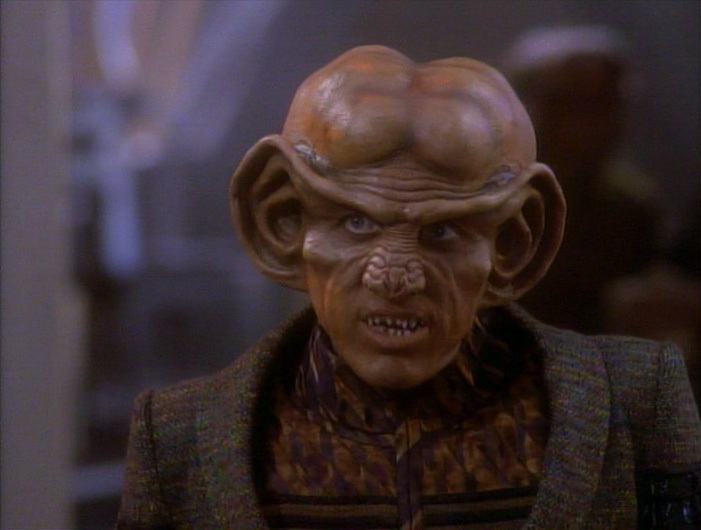 Armin Shimerman has a firm grasp of his Ferengi bar-owner Quark (he’d played one of the first Ferengis in TNG’s “The Last Outpost”), though his nose design is from a mold used for Max Grodenchik (who plays his brother Rom), as they were both finalists in the auditions for Quark. 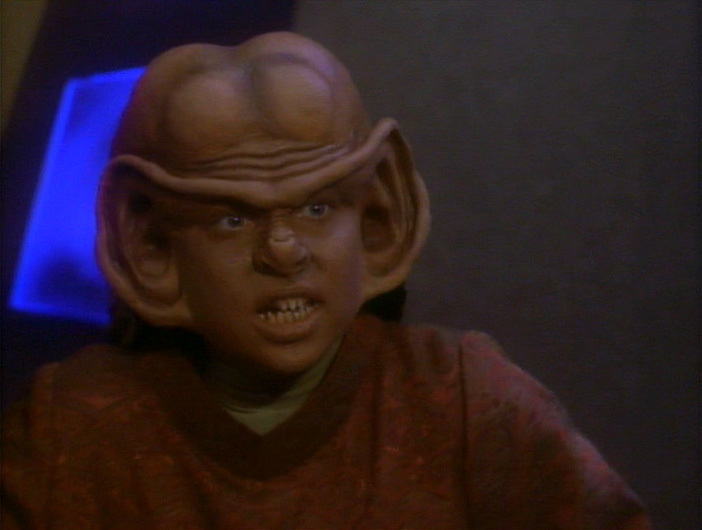 Aron Eisenberg’s Nog is also seen in the pilot, as an attempted looter who is captured by Odo. His character comes a long way over the course of the show, and it’s interesting to see his humble origins as a petty thief. Terry Farrell’s spotted Trill science officer Dax plays the character a bit more coolly and with a drier sense of humor than we see later in the series. Siddig El-Fadil (later Alexander Siddig) plays Dr. Julian Bashir with a distinct nervous stammer that is reminiscent of Christopher Reeve’s Clark Kent in the Superman movies. While this affectation of Siddig’s may simply have been a means to convey the character’s youth and inexperience, it may also be (unintentional) foreshadowing of a character revelation that makes the Clark Kent analogy even more fitting, in fact (see: S5’s “Doctor Bashir, I Presume…?”). 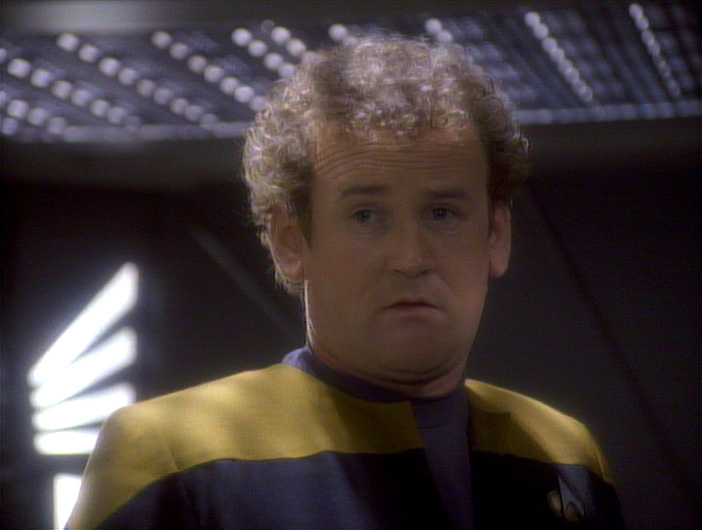 One carryover character from TNG into DS9 is the popular blue collar transporter chief Miles O’Brien (Colm Meaney) who gets a promotion to chief of operations (essentially chief engineer) of DS9. It’s interesting that two of DS9’s main characters, the commanding officer and chief engineer, don’t yet have their respective captain and lieutenant commander ranks we’ve seen in more traditional Star Trek series. 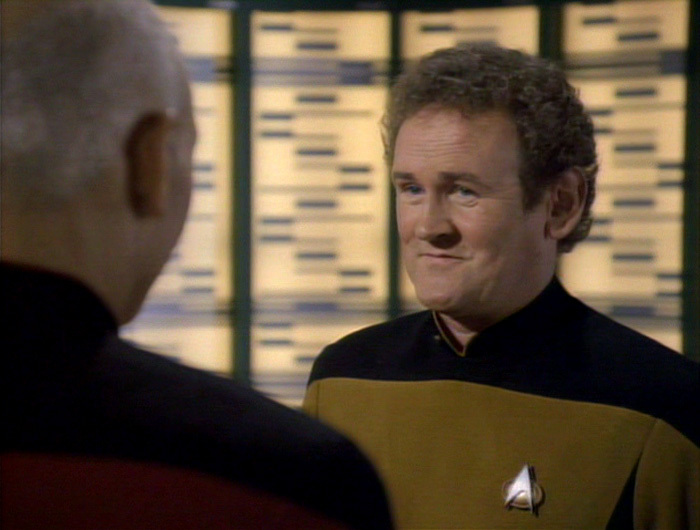 Sisko would eventually become a captain at the end of S3 (“The Adversary”), though O’Brien remained a non-commissioned officer. 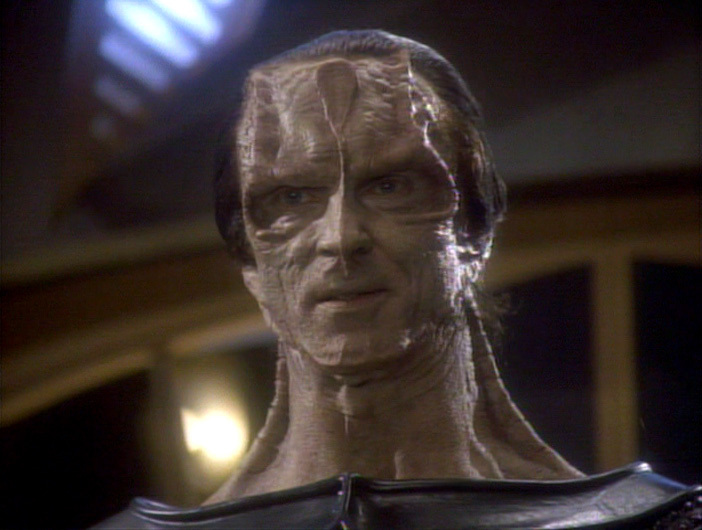 Main series antagonist Dukat (Marc Alaimo) is also very much present in the pilot, too. He is the “Q” to this series, though far more fallible and less powerful. He’s a villain with many weaknesses, and that makes him arguably more interesting to watch than John De Lancie’s omnipotent Q (who is entertaining in different ways). For me, one of the rougher patches of this otherwise smooth pilot is the over-reliance on quasi-religious ‘chosen one’-style prophetic mumbo jumbo that, while important to the overall arc of the show, is an overused science fiction/fantasy cliche. Whenever I hear it, I roll my eyes a bit, to be honest. 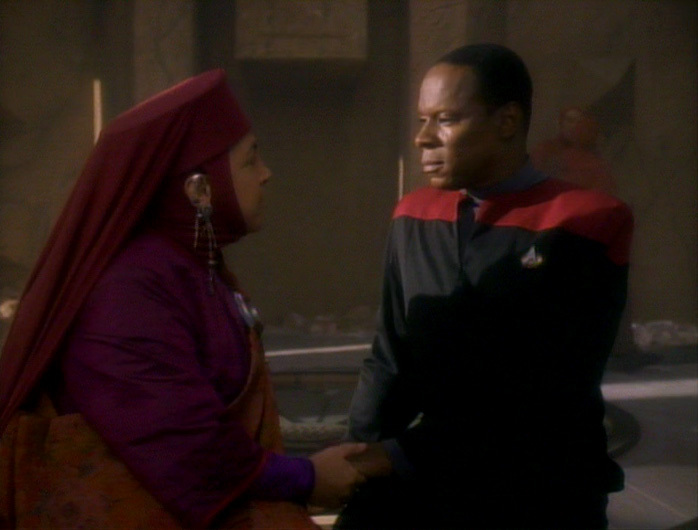 Like Sisko in the earlier seasons of the show, I’m not terribly comfortable with a Star Trek that steers into quasi-religious territories, but for this otherwise excellent show? I gladly make an exception. 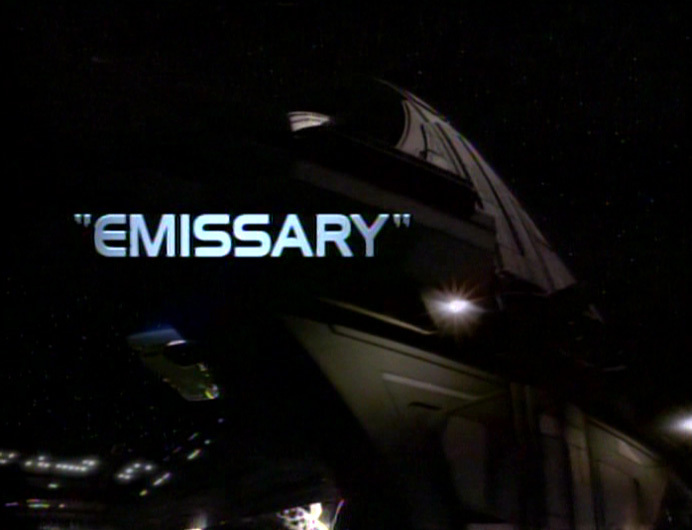 “Emissary” opens with one of the most crucial moments in Star Trek TNG lore; the infamous battle of Starfleet with the Borg at Wolf 359. 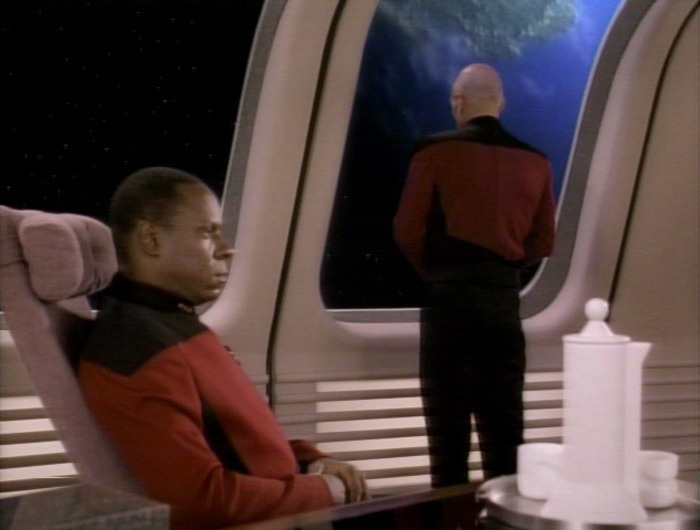 Sisko meets with Captain Picard aboard the Enterprise-D for a mission briefing, during which Sisko is openly hostile to Picard (he blames “Locutus” for the loss of his wife and his former starship). Chief O’Brien has a nice ‘last look around’ scene aboard his former starship before he officially disembarks for permanent assignment on the station. He also says his goodbye to Picard in a nice moment in the transporter room. Picard also returns to meet with Sisko one last time near the episode’s conclusion, pleased to find the commander seems to have made his peace with both Picard and his assignment (with a little help from the Prophets…). For more detailed reading on the subject of the various post-TOS Star Trek series? Give Mark Altman and Edward Gross’ book a try. DS9 marked something of a turning point. Star Trek could now launch a new series with all-new talent behind the scenes, and even without Gene Roddenberry’s input or blessing. 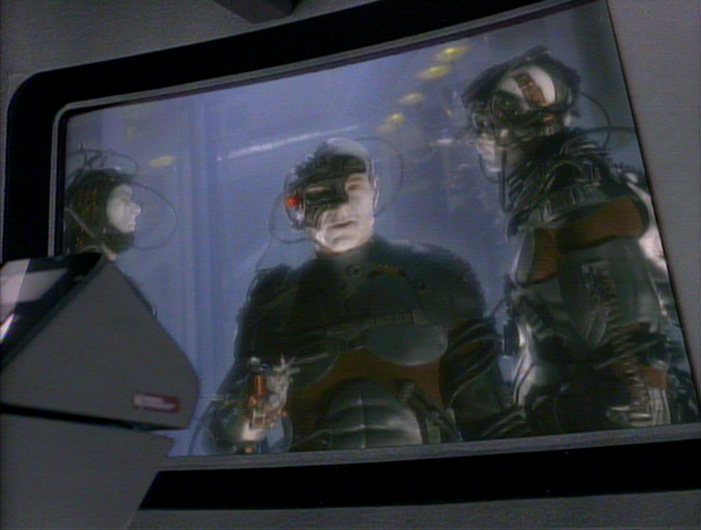 DS9 marked the first time that a Star Trek series tried something truly different. I love DS9 not just for what it was, but also what it tried to be. In my opinion, it often greatly surpassed its own potential. Sadly, DS9 wasn’t as great a hit in its time as it should’ve been; and Star Trek would eventually return (or retreat) to the more familiar ‘starship-in-space’ format of the original. “The Menagerie” is my all-time favorite TOS episode for both in-universe reasons (the instant history it gives the Enterprise) and real-world reasons (such a clever solution to a production budget challenge). I loved that the JJ Abrams films brought “back” Pike, and the character is one big reason I’m looking forward to season 2 of DSC. All of which is to say, I covet your seeing “Menagerie” on the big screen (even if the print was a bit too dark)! Great recap of the pilots! Thank you so much for reading! I’m also curious as to which other members of Pike’s crew we will see in DSC. Think it’s safe to say we’ll see a recast Spock and Number One. I have to admit I’m a bit of an “Encounter at Farpoint” apologist. It’s not great, and it definitely has some cringey moments, but John de Lancie is never not amazing, and it sets up “All Good Things…”, which is one of the greatest episodes of Star Trek ever. I remember waiting in such eager anticipation the night of the premiere…and then feeling such massive disappointment. But luckily I stuck with it, and the show blossomed into something truly impressive. Picard is now easily my favorite of the Star Trek captains.